← Another Article on More.com! 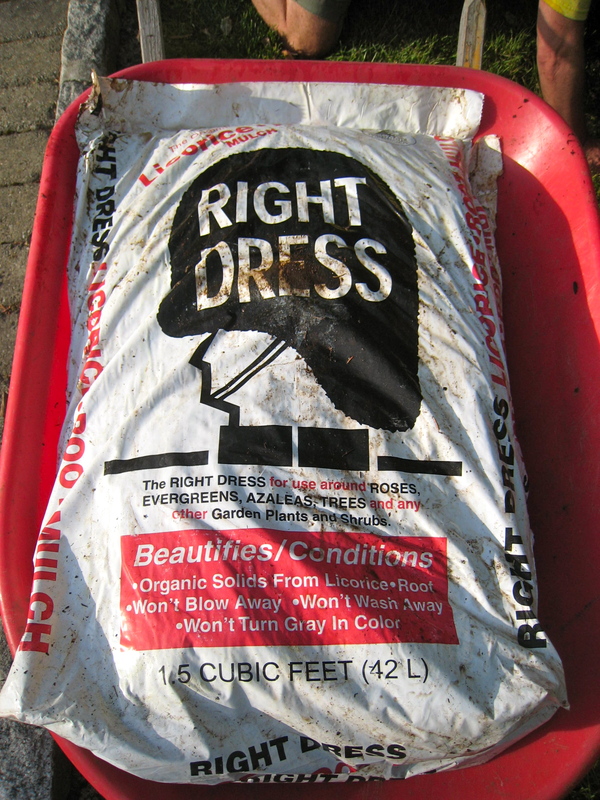 The only mulch we use. It doesn't have weed seeds or fungus. This past weekend my husband Mike and I mulched. Well, actually, I would drive and get the mulch and Mike would spread it around, and around, and around. It’s an annual rite in our family: Springtime is mulch time. Our teenagers, based on their past experiences with mulch, extreme filth and extreme odor, made themselves scarce this year; they worked elsewhere, for cash. We picked up 55 bags of mulch on Friday. My son Max and I went to a local garden center and loaded 25 bags into Mike’s old Ford Explorer and 30 bags into my Honda Pilot. Max, in his usual fashion, went speeding down the road, no problem. I, on the other hand, swayed my way home like a hula skirt gone wild on the hips of a talented island maiden. After arriving home safely Max and I figured I came thisclose to blowing the tires on the Pilot after reading the vehicle’s maximum weight load on the inside of the driver’s side door. Once Mike arrived home after his Saturday morning race (for those interested, he came in second in his age group. 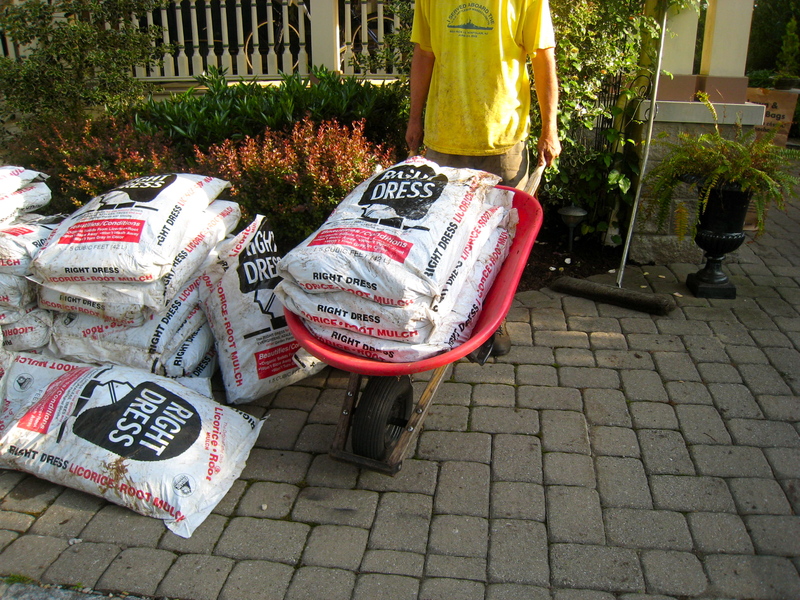 ), we drove back to the garden center and picked up 30 more bags of mulch. We drove home, unloaded them and drove back to the garden center. We bought 30 more bags, drove home and unloaded them too. A mere fraction of the mulch being used. At this point Mike the Mulch Man began to mulch in earnest. He mulched around the driveway beds. He mulched the two front beds next to the house. He mulched his way around the huge oak tree. He mulched around the hollies to the east. He mulched around the hollies to the west. He fell over tired after about 5 hours. On Sunday, after church we hopped in the old Explorer and drove back to the garden center. We bought 30 more bags of mulch, drove home and unloaded them, then made one more trip for another 30 bags. Are you tired yet? I was exhausted by that time! Mike the Mulch Man continued on his mission to mulch until no bare dirt remained to be seen. Or until he caught up to where I finished weeding. He mulched like a madman. And he fell over tired after about 5 hours. I put a beer in his cramped, filthy right hand in a vain attempt to revive him. Squatting for hours. It's a tedious job, but someone has to do it. 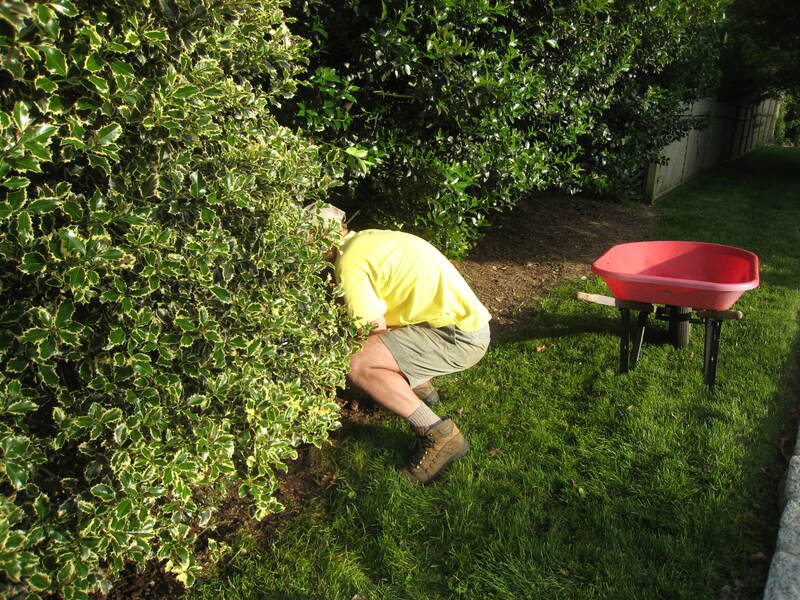 I still have weeding to do and Mike still has mulching to do. I will weed today if the rain holds off. Mike will have to wait until Saturday to mulch again. By the way, my advice is to never use your ‘good’ vehicle to transport mulch. Some of the mulch we transported in the Pilot was wet. The stinky juice oozed out of the bags, and settled in the carpeting in the back seat. The stench in my vehicle can only be likened to dog poop. . . from a very BIG, very SICK dog! And this is after mopping it up with a roll of paper towels and half a can of Lysol. You know mathematical Mike, right? He did the math and it would have cost us an extra $150-plus dollars to have it delivered since they charge a delivery fee per bag. So we did what we did (and do)! What’s the “math” if it is delivered by the yd.? And, I still swear by the newspaper layers where there are spaces available! 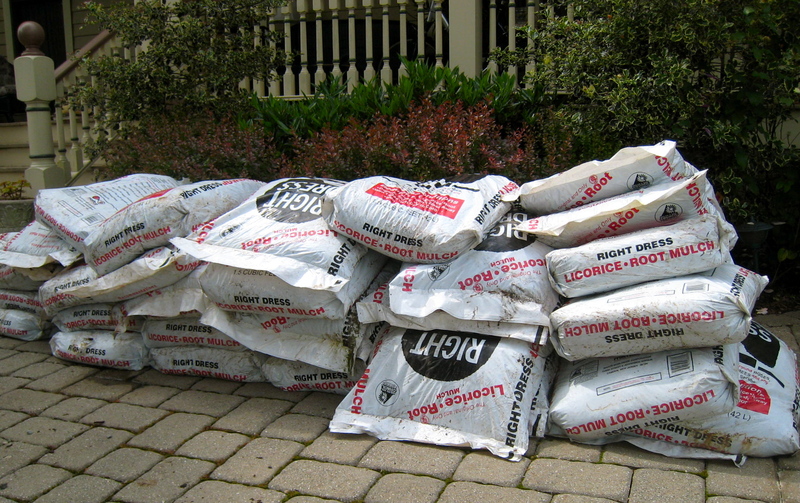 Just moisten so they aren’t flying all over the place – then put down that mulch. Oh ladies, you read my mind. Dar, please tell my “frugal” brother-in-law that even my “cheap” husband pays the extra to have it delivered. Or, he cons someone with a truck to go pick it up & drop it off for free!